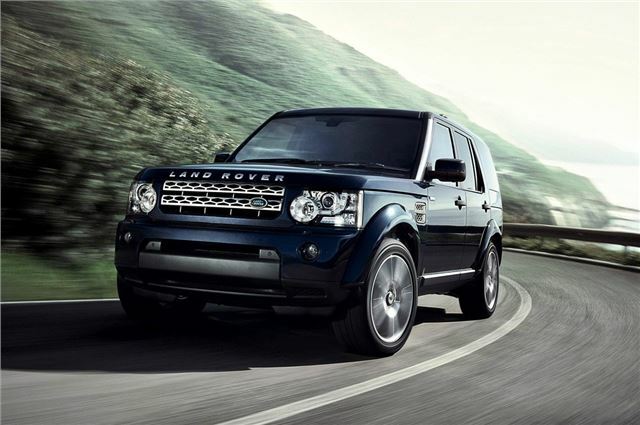 Land Rover is updating its Discovery 4 and Range Rover Sport models for 2012 with both getting a new eight-speed automatic gearbox while the 3.0-litre V6 diesel engine has been improved with more power and lower CO2 emissions. The Range Rover Sport is now also available with the Dual View touch-screen for the first time. In the Discovery, the new eight-speed automatic, which was first fitted to the Range Rover TDV8, helps improve efficiency with the 3.0 SDV6 emitting 244g/km down from 230g/km. Fuel economy also improves from slightly from 30.4mpg to 32.1mpg, helped by the fitting of a diesel particulate filter. Despite this, power is actually up with an extra 11hp, giving 256hp in total. The Discovery 4’s design and equipment levels have been given a makeover too. There are two new alloy wheel designs, three new option packs and improved audio and navigation systems. The entry-level audio system is upgraded with a colour screen replacing the previous black and white one plus it's available with Bluetooth, DAB and USB/iPod connectivity. The audio system is now available with a non-navigation touch-screen. The Harman Kardon System has been upgraded from nine speakers to 11 speakers and the output has been boosted from 240W to a substantial 380W. Navigation is available in two levels - Base and Premium, with the latter enhanced with voice activation. Touch screens have been revised and there's a ‘Virtual CD Autochanger’ on models equipped with hard-disc navigation which allows storage of up to 10 albums on the same hard drive. ‘Say What You See’ voice activation gets over the problem of memorising commands and prompts the driver by displaying commands in a step-by-step format on the screen. The Rear Seat Entertainment is now equipped with a single slot DVD drive. This replaces the previous six DVD Changer accessed through the luggage compartment. The rear seat audio system is operated by new wireless technology called WhiteFire via cordless headphones and can also be controlled by remote control. The system supports connectivity with games consoles and video playback of MP4 files stored on USB. There is a new Vision Assist Pack available, costing from £1000. This has xenon adaptive front headlamps with cornering lights, automatic headlights with high beam assist and the Surround Camera System including approach lamps, tow assist and tow hitch assist. Meanwhile the Range Rover Sport gets the same improvements to the engine with emissions down from 243g/km to 230g/km while the 5.0-litre V8 Supercharged remains unchanged. Design and equipment levels have moved up a level with colour changes to exterior detailing and new interior colours for the Autobiography Sport. A new powered single piece tailgate has also been introduced across the range for 2012. For the first time on the Range Rover Sport, the next generation 7-inch touch-screen is available with optional Dual View technology, allowing the driver to view the navigation display while the passenger watches TV or a DVD and listens on WhiteFireheadphones. The rear seat entertainment package has also been enhanced with the availability of WhiteFire wireless technology. Improvements have been made to the Hi-ICE and Premium audio systems, offering 825W of power through 17 speakers on the Premium Harmon Kardon LOGIC 7. A Luxury Pack is also available on the 3.0 SDV6 HSE bringing equipment levels close to that of Supercharged models. The pack includes contrast stitching on selected upholstery, 20-inch alloy wheels, Premium ICE, extended leather pack, HSE Luxury badge, heated steering wheel and adaptive cruise control. The Luxury Pack costs £3,065.